Caffeine is a highly popular nervous-system stimulant commonly used to alleviate fatigue and increase alertness or wakefulness. According to the Mayo Clinic, caffeine intake of 500 milligrams or more per day can cause a plethora of negative effects ranging from insomnia, nervousness, restlessness, irritability, nausea, irregular heartbeat, headaches and muscle tremors. 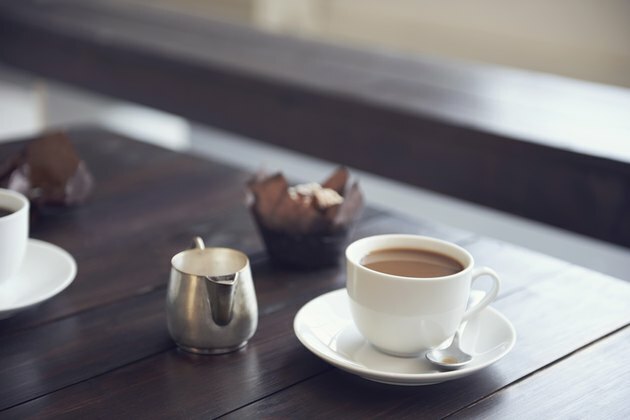 While it is generally considered safe for most individuals to consume 200 to 300 milligrams daily of caffeine — the equivalent of two to three cups of coffee — individuals who experience discomfort can neutralize its effects. Drink at least 32 ounces of filtered water to help your body begin flushing out the caffeine substance. Drink all 32 ounces in a period of five to 10 minutes to begin re-hydrating your body and restoring minerals that might have been depleted by the caffeine. Eat one to three servings of fruit or other citrus food high in vitamin C to help restore the minerals sapped by caffeine. According to "The American Journal of Clinical Nutrition," caffeine alters the plasma, whole blood and leukocyte levels regulated by vitamin C concentrations, resulting in a vitamin deficiency in cases of caffeine excess. Make a fruit salad of sliced organic apples, bananas and oranges to help your body combat the vitamin-leeching effects of caffeine. Repair the anxiousness, restlessness and general stressed emotional effects caused by caffeine by taking time out to relax. Set a digital timer for 15 to 60 minutes and select a quiet, solitary area where you can comfortably sit and meditate. Close your eyes and focus on your breathing as you allow your pulse to slow to the rhythm of your breaths. Place one drop of lavender essential oil on your upper lip, directly below your nostrils, to access the calming properties of that herb. Enjoy a healthy meal to help your stomach and digestive system absorb and break down the caffeine. Caffeine is an appetite suppressant, CNN reports, which may confuse the body's natural reminders to eat food throughout the day. Eat a hearty meal including whole grains such as brown rice and beans, as well as leafy greens such as kale and chard. Exercise may also help speed up your body’s ability to remove caffeine. Burn off that extra energy with a 15 minutes of aerobic exercise such as jogging, swimming, hiking or hot yoga. Consult your doctor if you encounter any negative symptoms such as dizziness, anxiety or digestive complications. If you experience negative symptoms frequently, ask your doctor for an allergy test to determine if you are allergic to caffeine. Mayo Clinic: Caffeine - You May Like Caffeine's Effects, But How Much is Too Much?